9x12, xlviii + 156 pp. 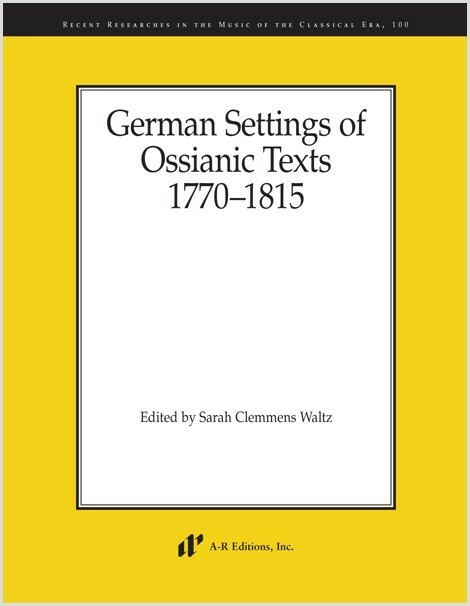 This edition contains vocal works with keyboard accompaniment setting Ossianic texts by German composers. James Macpherson’s Works of Ossian, purported to be prose translations of Gaelic poetry handed down in oral tradition from the third-century bard Ossian, was viewed as comparable with Homer and Shakespeare. Hardly a poet or composer of the period is free of Ossianic influence, though very few of the numerous settings of these texts (besides Schubert’s and Brahms’s) are known today. Among others, this volume contains Johann Rudolf Zumsteeg’s lengthy Colma, known for having influenced Schubert’s through-composed style, and Carl Friedrich Zelter’s surprisingly dramatic setting of the same text. Other settings are by Neefe, Seckendorff, Reichardt, Kunzen, Götzloff, and Himmel, and many were distinctly praised by contemporary critics. These frequently melodramatic and unusual settings link the Sturm und Drang of the 1770s to nineteenth-century musical Romanticism. Performance parts (for violin) are available as a separate purchase (see product C100P). Digital Print is also available for this title.